PanARMENIAN.Net - Cher swept her costars away during the making of Mamma Mia! Here We Go Again. The 72-year-old icon, who has Armenian roots, plays Ruby, the mother of Meryl Streep‘s character in the film, who comes to visit the little Greek island her granddaughter, Sophie (Amanda Seyfried), calls home in the 2018 hit sequel. 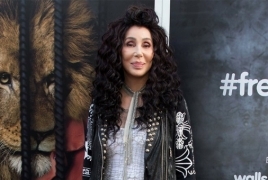 In a PEOPLE exclusive clip, Cher’s costars couldn’t help but gush about the singer’s performance of ABBA’s “Fernando” during the film. Dominic Cooper, who plays Seyfried’s love interest in the film, agrees. “She walked up onto the stage and then that voice comes out,” he marvels. ABBA singer and film producer Björn Ulvaeus was amazed at how well she sang their hit 1980 song. “To hear her sing ‘Fernando’ was a perfect revelation. She was perfect for that song,” he says, smiling. “It was like a performance and this was very much an acting performance first,” she adds. The film is available on digital on Oct. 9 and in Blu-Ray and DVD on Oct. 23.